The term "hysteresis" is derived from ὑστέρησις, an Ancient Greek word meaning "deficiency" or "lagging behind". It was coined around 1890 by Sir James Alfred Ewing to describe the behaviour of magnetic materials. Some early work on describing hysteresis in mechanical systems was performed by James Clerk Maxwell. Subsequently, hysteretic models have received significant attention in the works of Ferenc Preisach (Preisach model of hysteresis), Louis Néel and D. H. Everett in connection with magnetism and absorption. A more formal mathematical theory of systems with hysteresis was developed in the 1970s by a group of Russian mathematicians led by Mark Krasnosel'skii. ; it is mathematically equivalent to a transfer function in linear filter theory and analogue signal processing. This kind of hysteresis is often referred to as rate-dependent hysteresis. If the input is reduced to zero, the output continues to respond for a finite time. This constitutes a memory of the past, but a limited one because it disappears as the output decays to zero. The phase lag depends on the frequency of the input, and goes to zero as the frequency decreases. When rate-dependent hysteresis is due to dissipative effects like friction, it is associated with power loss. Systems with rate-independent hysteresis have a persistent memory of the past that remains after the transients have died out. The future development of such a system depends on the history of states visited, but does not fade as the events recede into the past. If an input variable X(t) cycles from X0 to X1 and back again, the output Y(t) may be Y0 initially but a different value Y2 upon return. The values of Y(t) depend on the path of values that X(t) passes through but not on the speed at which it traverses the path. Many authors restrict the term hysteresis to mean only rate-independent hysteresis. Hysteresis effects can be characterized using the Preisach model and the generalized Prandtl-Ishlinskii model. In control systems, hysteresis can be used to filter signals so that the output reacts less rapidly than it otherwise would, by taking recent history into account. For example, a thermostat controlling a heater may switch the heater on when the temperature drops below A, but not turn it off until the temperature rises above B. (For instance, if one wishes to maintain a temperature of 20 °C then one might set the thermostat to turn the heater on when the temperature drops to below 18 °C and off when the temperature exceeds 22 °C). Similarly, a pressure switch can be designed to exhibit hysteresis, with pressure set-points substituted for temperature thresholds. Often, some amount of hysteresis is intentionally added to an electronic circuit to prevent unwanted rapid switching. This and similar techniques are used to compensate for contact bounce in switches, or noise in an electrical signal. A Schmitt trigger is a simple electronic circuit that exhibits this property. A latching relay uses a solenoid to actuate a ratcheting mechanism that keeps the relay closed even if power to the relay is terminated. Hysteresis is essential to the workings of some memristors (circuit components which "remember" changes in the current passing through them by changing their resistance). Hysteresis can be used when connecting arrays of elements such as nanoelectronics, electrochrome cells and memory effect devices using passive matrix addressing. Shortcuts are made between adjacent components (see crosstalk) and the hysteresis helps to keep the components in a particular state while the other components change states. Thus, all rows can be addressed at the same time instead of individually. In the field of audio electronics, a noise gate often implements hysteresis intentionally to prevent the gate from "chattering" when signals close to its threshold are applied. A hysteresis is sometimes intentionally added to computer algorithms. The field of user interface design has borrowed the term hysteresis to refer to times when the state of the user interface intentionally lags behind the apparent user input. For example, a menu that was drawn in response to a mouse-over event may remain on-screen for a brief moment after the mouse has moved out of the trigger region and the menu region. This allows the user to move the mouse directly to an item on the menu, even if part of that direct mouse path is outside of both the trigger region and the menu region. For instance, right-clicking on the desktop in most Windows interfaces will create a menu that exhibits this behavior. In aerodynamics, hysteresis can be observed when decreasing the angle of attack of a wing after stall, regarding the lift and drag coefficients. The angle of attack at which the flow on top of the wing reattaches is generally lower than the angle of attack at which the flow separates during the increase of the angle of attack. Elastic hysteresis of an idealized rubber band. The area in the centre of the hysteresis loop is the energy dissipated due to internal friction. In the elastic hysteresis of rubber, the area in the centre of a hysteresis loop is the energy dissipated due to material internal friction. Elastic hysteresis was one of the first types of hysteresis to be examined. The effect can be demonstrated using a rubber band with weights attached to it. If the top of a rubber band is hung on a hook and small weights are attached to the bottom of the band one at a time, it will get longer. As more weights are loaded onto it, the band will continue to extend because the force the weights are exerting on the band is increasing. When each weight is taken off, or unloaded, the band will get shorter as the force is reduced. As the weights are taken off, each weight that produced a specific length as it was loaded onto the band now produces a slightly longer length as it is unloaded. This is because the band does not obey Hooke's law perfectly. The hysteresis loop of an idealized rubber band is shown in the figure. In terms of force, the rubber band was harder to stretch when it was being loaded than when it was being unloaded. In terms of time, when the band is unloaded, the effect (the length) lagged behind the cause (the force of the weights) because the length has not yet reached the value it had for the same weight during the loading part of the cycle. In terms of energy, more energy was required during the loading than the unloading, the excess energy being dissipated as thermal energy. Elastic hysteresis is more pronounced when the loading and unloading is done quickly than when it is done slowly. Some materials such as hard metals don't show elastic hysteresis under a moderate load, whereas other hard materials like granite and marble do. Materials such as rubber exhibit a high degree of elastic hysteresis. When the intrinsic hysteresis of rubber is being measured, the material can be considered to behave like a gas. When a rubber band is stretched it heats up, and if it is suddenly released, it cools down perceptibly. These effects correspond to a large hysteresis from the thermal exchange with the environment and a smaller hysteresis due to internal friction within the rubber. This proper, intrinsic hysteresis can be measured only if the rubber band is adiabatically isolated. Small vehicle suspensions using rubber (or other elastomers) can achieve the dual function of springing and damping because rubber, unlike metal springs, has pronounced hysteresis and does not return all the absorbed compression energy on the rebound. Mountain bikes have made use of elastomer suspension, as did the original Mini car. The primary cause of rolling resistance when a body (such as a ball, tire, or wheel) rolls on a surface is hysteresis. This is attributed to the viscoelastic characteristics of the material of the rolling body. The contact angle formed between a liquid and solid phase will exhibit a range of contact angles that are possible. There are two common methods for measuring this range of contact angles. The first method is referred to as the tilting base method. Once a drop is dispensed on the surface with the surface level, the surface is then tilted from 0° to 90°. As the drop is tilted, the downhill side will be in a state of imminent wetting while the uphill side will be in a state of imminent dewetting. As the tilt increases the downhill contact angle will increase and represents the advancing contact angle while the uphill side will decrease; this is the receding contact angle. The values for these angles just prior to the drop releasing will typically represent the advancing and receding contact angles. 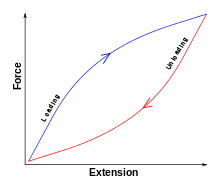 The difference between these two angles is the contact angle hysteresis. The second method is often referred to as the add/remove volume method. When the maximum liquid volume is removed from the drop without the interfacial area decreasing the receding contact angle is thus measured. When volume is added to the maximum before the interfacial area increases, this is the advancing contact angle. As with the tilt method, the difference between the advancing and receding contact angles is the contact angle hysteresis. Most researchers prefer the tilt method; the add/remove method requires that a tip or needle stay embedded in the drop which can affect the accuracy of the values, especially the receding contact angle. The equilibrium shapes of bubbles expanding and contracting on capillaries (blunt needles) can exhibit hysteresis depending on the relative magnitude of the maximum capillary pressure to ambient pressure, and the relative magnitude of the bubble volume at the maximum capillary pressure to the dead volume in the system. The bubble shape hysteresis is a consequence of gas compressibility, which causes the bubbles to behave differently across expansion and contraction. During expansion, bubbles undergo large non equilibrium jumps in volume, while during contraction the bubbles are more stable and undergo a relatively smaller jump in volume resulting in an asymmetry across expansion and contraction. The bubble shape hysteresis is qualitatively similar to the adsorption hysteresis, and as in the contact angle hysteresis, the interfacial properties play an important role in bubble shape hysteresis. The existence of the bubble shape hysteresis has important consequences in interfacial rheology experiments involving bubbles. As a result of the hysteresis, not all sizes of the bubbles can be formed on a capillary. Further the gas compressibility causing the hysteresis leads to unintended complications in the phase relation between the applied changes in interfacial area to the expected interfacial stresses. These difficulties can be avoided by designing experimental systems to avoid the bubble shape hysteresis. Hysteresis can also occur during physical adsorption processes. In this type of hysteresis, the quantity adsorbed is different when gas is being added than it is when being removed. The specific causes of adsorption hysteresis are still an active area of research, but it is linked to differences in the nucleation and evaporation mechanisms inside mesopores. These mechanisms are further complicated by effects such as cavitation and pore blocking. In physical adsorption, hysteresis is evidence of mesoporosity-indeed, the definition of mesopores (2–50 nm) is associated with the appearance (50 nm) and disappearance (2 nm) of mesoporosity in nitrogen adsorption isotherms as a function of Kelvin radius. An adsorption isotherm showing hysteresis is said to be of Type IV (for a wetting adsorbate) or Type V (for a non-wetting adsorbate), and hysteresis loops themselves are classified according to how symmetric the loop is. Adsorption hysteresis loops also have the unusual property that it is possible to scan within a hysteresis loop by reversing the direction of adsorption while on a point on the loop. The resulting scans are called "crossing," "converging," or "returning," depending on the shape of the isotherm at this point. The relationship between matric water potential and water content is the basis of the water retention curve. Matric potential measurements (Ψm) are converted to volumetric water content (θ) measurements based on a site or soil specific calibration curve. Hysteresis is a source of water content measurement error. Matric potential hysteresis arises from differences in wetting behaviour causing dry medium to re-wet; that is, it depends on the saturation history of the porous medium. Hysteretic behaviour means that, for example, at a matric potential (Ψm) of 5 kPa, the volumetric water content (θ) of a fine sandy soil matrix could be anything between 8% to 25%. 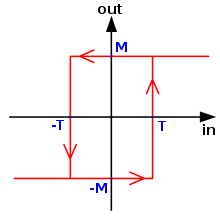 Tensiometers are directly influenced by this type of hysteresis. Two other types of sensors used to measure soil water matric potential are also influenced by hysteresis effects within the sensor itself. Resistance blocks, both nylon and gypsum based, measure matric potential as a function of electrical resistance. The relation between the sensor’s electrical resistance and sensor matric potential is hysteretic. Thermocouples measure matric potential as a function of heat dissipation. Hysteresis occurs because measured heat dissipation depends on sensor water content, and the sensor water content–matric potential relationship is hysteretic. As of 2002[update], only desorption curves are usually measured during calibration of soil moisture sensors. Despite the fact that it can be a source of significant error, the sensor specific effect of hysteresis is generally ignored. Theoretical model of magnetization m against magnetic field h. Starting at the origin, the upward curve is the initial magnetization curve. The downward curve after saturation, along with the lower return curve, form the main loop. The intercepts hc and mrs are the coercivity and saturation remanence. When an external magnetic field is applied to a ferromagnetic material such as iron, the atomic domains align themselves with it. Even when the field is removed, part of the alignment will be retained: the material has become magnetized. Once magnetized, the magnet will stay magnetized indefinitely. To demagnetize it requires heat or a magnetic field in the opposite direction. This is the effect that provides the element of memory in a hard disk drive. A closer look at a magnetization curve generally reveals a series of small, random jumps in magnetization called Barkhausen jumps. This effect is due to crystallographic defects such as dislocations. Magnetic hysteresis loops are not exclusive to materials with ferromagnetic ordering. Other magnetic orderings, such as spin glass ordering, also exhibit this phenomenon. The phenomenon of hysteresis in ferromagnetic materials is the result of two effects: rotation of magnetization and changes in size or number of magnetic domains. In general, the magnetization varies (in direction but not magnitude) across a magnet, but in sufficiently small magnets, it does not. In these single-domain magnets, the magnetization responds to a magnetic field by rotating. Single-domain magnets are used wherever a strong, stable magnetization is needed (for example, magnetic recording). Larger magnets are divided into regions called domains. Across each domain, the magnetization does not vary; but between domains are relatively thin domain walls in which the direction of magnetization rotates from the direction of one domain to another. If the magnetic field changes, the walls move, changing the relative sizes of the domains. Because the domains are not magnetized in the same direction, the magnetic moment per unit volume is smaller than it would be in a single-domain magnet; but domain walls involve rotation of only a small part of the magnetization, so it is much easier to change the magnetic moment. The magnetization can also change by addition or subtraction of domains (called nucleation and denucleation). There are a great variety of applications of the hysteresis in ferromagnets. Many of these make use of their ability to retain a memory, for example magnetic tape, hard disks, and credit cards. In these applications, hard magnets (high coercivity) like iron are desirable so the memory is not easily erased. Magnetically soft (low coercivity) iron is used for the cores in electromagnets. The low coercivity reduces that energy loss associated with hysteresis. The low energy loss during a hysteresis loop is also the reason why soft iron is used for transformer cores and electric motors. Electrical hysteresis typically occurs in ferroelectric material, where domains of polarization contribute to the total polarization. Polarization is the electrical dipole moment (either C·m−2 or C·m). The mechanism, an organization of the polarization into domains, is similar to that of magnetic hysteresis. Hysteresis manifests itself in state transitions when melting temperature and freezing temperature do not agree. For example, agar melts at 85 °C and solidifies from 32 to 40 °C. This is to say that once agar is melted at 85 °C, it retains a liquid state until cooled to 40 °C. Therefore, from the temperatures of 40 to 85 °C, agar can be either solid or liquid, depending on which state it was before. Hysteresis in cell biology often follows bistable systems where the same input state can lead to two different, stable outputs. Where bistability can lead to digital, switch-like outputs from the continuous inputs of chemical concentrations and activities, hysteresis makes these systems more resistant to noise. These systems are often characterized by higher values of the input required to switch into a particular state as compared to the input required to stay in the state, allowing for a transition that is not continuously reversible, and thus less susceptible to noise. Cells undergoing cell division exhibit hysteresis in that it takes a higher concentration of cyclins to switch them from G2 phase into mitosis than to stay in mitosis once begun. Biochemical systems can also show hysteresis-like output when slowly varying states that are not directly monitored are involved, as in the case of the cell cycle arrest in yeast in exposed to mating pheromone. Here, the duration of cell cycle arrest depends not only on the final level of input Fus3, but also on the previously achieved Fus3 levels. This effect is achieved in due to the slower time scales involved in the transcription of intermediate Far1, such that the total Far1 activity reaches its equilibrium value slowly, and for transient changes in Fus3 concentration, the response of the system depends on the Far1 concentration achieved with the transient value. Experiments in this type of hysteresis benefit from the ability to change the concentration of the inputs with time. The mechanisms are often elucidated by allowing independent control of the concentration of the key intermediate, for instance, by using an inducible promoter. Darlington in his classic works on genetics discussed hysteresis of the chromosomes, by which he meant "failure of the external form of the chromosomes to respond immediately to the internal stresses due to changes in their molecular spiral", as they lie in a somewhat rigid medium in the limited space of the cell nucleus. In developmental biology, cell type diversity is regulated by long range-acting signaling molecules called morphogens that pattern uniform pools of cells in a concentration- and time-dependent manner. The morphogen sonic hedgehog (Shh), for example, acts on limb bud and neural progenitors to induce expression of a set of homeodomain-containing transcription factors to subdivide these tissues into distinct domains. It has been shown that these tissues have a 'memory' of previous exposure to Shh. In neural tissue, this hysteresis is regulated by a homeodomain (HD) feedback circuit that amplifies Shh signaling. In this circuit, expression of Gli transcription factors, the executors of the Shh pathway, is suppressed. Glis are processed to repressor forms (GliR) in the absence of Shh, but in the presence of Shh, a proportion of Glis are maintained as full-length proteins allowed to translocate to the nucleus, where they act as activators (GliA) of transcription. By reducing Gli expression then, the HD transcription factors reduce the total amount of Gli (GliT), so a higher proportion of GliT can be stabilized as GliA for the same concentration of Shh. There is some evidence that T cells exhibit hysteresis in that it takes a lower signal threshold to activate T cells that have been previously activated. Ras activation is required for downstream effector functions of activated T cells. Triggering of the T cell receptor induces high levels of Ras activation, which results in higher levels of GTP-bound (active) Ras at the cell surface. Since higher levels of active Ras have accumulated at the cell surface in T cells that have been previously stimulated by strong engagement of the T cell receptor, weaker subsequent T cell receptor signals received shortly afterwards will deliver the same level of activation due to the presence of higher levels of already activated Ras as compared to a naïve cell. The property by which some neurons do not return to their basal conditions from a stimulated condition immediately after removal of the stimulus is an example of hysteresis. Lung hysteresis is evident when observing the compliance of a lung on inspiration versus expiration. The difference in compliance (Δvolume/Δpressure) is due to the additional energy required to overcome surface tension forces during inspiration to recruit and inflate additional alveoli. The transpulmonary pressure vs Volume curve of inhalation is different from the Pressure vs Volume curve of exhalation, the difference being described as hysteresis. Lung volume at any given pressure during inhalation is less than the lung volume at any given pressure during exhalation. A hysteresis effect may be observed in voicing onset versus offset. The threshold value of the subglottal pressure required to start the vocal fold vibration is lower than the threshold value at which the vibration stops, when other parameters are kept constant. In utterances of vowel-voiceless consonant-vowel sequences during speech, the intraoral pressure is lower at the voice onset of the second vowel compared to the voice offset of the first vowel, the oral airflow is lower, the transglottal pressure is larger and the glottal width is smaller. Hysteresis is a commonly encountered phenomenon in ecology and epidemiology, where the observed equilibrium of a system can not be predicted solely based on environmental variables, but also requires knowledge of the system's past history. Notable examples include the theory of spruce budworm outbreaks and behavioral-effects on disease transmission. Economic systems can exhibit hysteresis. For example, export performance is subject to strong hysteresis effects: because of the fixed transportation costs it may take a big push to start a country's exports, but once the transition is made, not much may be required to keep them going. When some negative shock reduces employment in a company or industry, fewer employed workers then remain. As usually the employed workers have the power to set wages, their reduced number incentivizes them to bargain for even higher wages when the economy again gets better instead of letting the wage be at the equilibrium wage level, where the supply and demand of workers would match. This causes hysteresis: the unemployment becomes permanently higher after negative shocks. The idea of hysteresis is used extensively in the area of labor economics, specifically with reference to the unemployment rate. According to theories based on hysteresis, severe economic downturns (recession) and/or persistent stagnation (slow demand growth, usually after a recession) cause unemployed individuals to lose their job skills (commonly developed on the job) or to find that their skills have become obsolete, or become demotivated, disillusioned or depressed or lose job-seeking skills. In addition, employers may use time spent in unemployment as a screening tool, i.e., to weed out less desired employees in hiring decisions. Then, in times of an economic upturn, recovery, or "boom", the affected workers will not share in the prosperity, remaining unemployed for long periods (e.g., over 52 weeks). This makes unemployment "structural", i.e., extremely difficult to reduce simply by increasing the aggregate demand for products and labor without causing increased inflation. That is, it is possible that a ratchet effect in unemployment rates exists, so a short-term rise in unemployment rates tends to persist. For example, traditional anti-inflationary policy (the use of recession to fight inflation) leads to a permanently higher "natural" rate of unemployment (more scientifically known as the NAIRU). This occurs first because inflationary expectations are "sticky" downward due to wage and price rigidities (and so adapt slowly over time rather than being approximately correct as in theories of rational expectations) and second because labor markets do not clear instantly in response to unemployment. The existence of hysteresis has been put forward as a possible explanation for the persistently high unemployment of many economies in the 1990s. Hysteresis has been invoked by Olivier Blanchard among others to explain the differences in long run unemployment rates between Europe and the United States. Labor market reform (usually meaning institutional change promoting more flexible wages, firing, and hiring) or strong demand-side economic growth may not therefore reduce this pool of long-term unemployed. Thus, specific targeted training programs are presented as a possible policy solution. However, the hysteresis hypothesis suggests such training programs are aided by persistently high demand for products (perhaps with incomes policies to avoid increased inflation), which reduces the transition costs out of unemployment and into paid employment easier. Hysteresis occurs in applications of game theory to economics, in models with product quality, agent honesty or corruption of various institutions. Slightly different initial conditions can lead to opposite outcomes and resulting stable good and bad equilibria. Each subject that involves hysteresis has models that are specific to the subject. In addition, there are models that capture general features of many systems with hysteresis. An example is the Preisach model of hysteresis, which represents a hysteresis nonlinearity as a linear superposition of square loops called non-ideal relays. Many complex models of hysteresis arise from the simple parallel connection, or superposition, of elementary carriers of hysteresis termed hysterons. A simple and intuitive parametric description of various hysteresis loops may be found in the Lapshin model. Along with the classical loop, substitution of trapezoidal or triangle pulses instead of the harmonic functions allows piecewise-linear hysteresis loops frequently used in discrete automatics to be built in the model. There is an implementation of the hysteresis model in R programming language (package Hysteresis). The Bouc–Wen model of hysteresis is often used to describe non-linear hysteretic systems. It was introduced by Bouc and extended by Wen, who demonstrated its versatility by producing a variety of hysteretic patterns. This model is able to capture in analytical form, a range of shapes of hysteretic cycles which match the behaviour of a wide class of hysteretical systems; therefore, given its versability and mathematical tractability, the Bouc–Wen model has quickly gained popularity and has been extended and applied to a wide variety of engineering problems, including multi-degree-of-freedom (MDOF) systems, buildings, frames, bidirectional and torsional response of hysteretic systems two- and three-dimensional continua, and soil liquefaction among others. The Bouc–Wen model and its variants/extensions have been used in applications of structural control, in particular in the modeling of the behaviour of magnetorheological dampers, base isolation devices for buildings and other kinds of damping devices; it has also been used in the modelling and analysis of structures built of reinforced concrete, steel, masonry and timber.. The most important extension of Bouc-Wen Model was carried out by Baber and Noori and later by Noori and co-workers. That extended model, named, BWBN, can reproduce the complex shear pinching or slip-lock phenomenon that earlier model could not reproduce. BWBN model has been widely used in a wide spectrum of applications and have been incorporated in several software codes such as OpenSees. ^ a b c Mayergoyz, Isaak D. (2003). Mathematical Models of Hysteresis and their Applications: Second Edition (Electromagnetism). Academic Press. ISBN 978-0-12-480873-7. ^ a b c d Bertotti, Giorgio (1998). "Ch. 2". Hysteresis in magnetism: For physicists, materials scientists, and engineers. Academic Press. ISBN 978-0-12-093270-2. ^ The term is attributed to Truesdell & Noll 1965 by Visintin 1994, page 13. ^ Johnson, R. Colin. "'Missing link' memristor created: Rewrite the textbooks?". EE Times April 30, 2008. Retrieved 27 September 2011. ^ Zifeng Yang; Hirofumi Igarashi; Mathew Martin; Hui Hu (Jan 7–10, 2008). An Experimental Investigation on Aerodynamic Hysteresis of a Low-Reynolds Number Airfoil (pdf). 46th AIAA Aerospace Sciences Meeting and Exhibit. Reno, Nevada: American Institute of Aeronautics and Astronautics. AIAA-2008-0315. ^ Love, Augustus E. (1927). Treatise on the Mathematical Theory of Elasticity (Dover Books on Physics & Chemistry). New York: Dover Publications. ISBN 978-0-486-60174-8. ^ Ewing, J. A. (1889). "On hysteresis in the relation of strain to stress". British Association Reports: 502. ^ Hopkinson, B.; Williams, G. T. (1912). "The Elastic Hysteresis of Steel". Proceedings of the Royal Society. 87 (598): 502. Bibcode:1912RSPSA..87..502H. doi:10.1098/rspa.1912.0104. ^ a b Chandran Suja, V.; Frostad, J. M.; Fuller, G. G. (2016-10-31). "Impact of Compressibility on the Control of Bubble-Pressure Tensiometers". Langmuir. 32 (46): 12031–12038. doi:10.1021/acs.langmuir.6b03258. ISSN 0743-7463. PMID 27798833. ^ Alvarez, Nicolas J.; Walker, Lynn M.; Anna, Shelley L. (2010-08-17). "A Microtensiometer To Probe the Effect of Radius of Curvature on Surfactant Transport to a Spherical Interface". Langmuir. 26 (16): 13310–13319. doi:10.1021/la101870m. ISSN 0743-7463. PMID 20695573. ^ Gregg, S. J.; Sing, Kenneth S. W. (1982). Adsorption, Surface Area, and Porosity (Second ed.). London: Academic Press. ISBN 978-0-12-300956-2. ^ Sing, K. S. W.; Everett, D. H.; Haul, R. A. W.; Moscou, L.; Pierotti, R. A.; J. Roquérol, J.; Siemieniewska, T. (1985). "Reporting physisorption data for gas/solid systems with special reference to the determination of surface area and porosity (Recommendations 1984)". Pure and Applied Chemistry. 57 (4): 603–619. doi:10.1351/pac198557040603. ^ Tompsett, G. A.; Krogh, L.; Griffin, D. W.; Conner, W. C. (2005). "Hysteresis and Scanning Behavior of Mesoporous Molecular Sieves". Langmuir. 21 (8): 8214–8225. doi:10.1021/la050068y. PMID 16114924. ^ Parkes, Martin (8 April 1999). "Subject: Accuracy of capacitance soil moisture ..." SOWACS (Mailing list). Archived from the original on 28 September 2011. Retrieved 28 September 2011. ^ Scanlon, Bridget R.; Andraski, Brian J.; Bilskie, Jim (2002). "3.2.4 Miscellaneous methods for measuring matric or water potential". Methods of Soil Analysis: Part 4 Physical Methods (PDF). SSSA Book Series. Soil Science Society of America. pp. 643–670. doi:10.2136/sssabookser5.4.c23. ISBN 978-0-89118-893-3. Archived from the original (PDF) on 2006-03-13. Retrieved 2006-05-26. ^ Monod, P.; PréJean, J. J.; Tissier, B. (1979). "Magnetic hysteresis of CuMn in the spin glass state". J. Appl. Phys. 50 (B11): 7324. Bibcode:1979JAP....50.7324M. doi:10.1063/1.326943. ^ Vincent Francois-Lavet et al (2011-11-14). 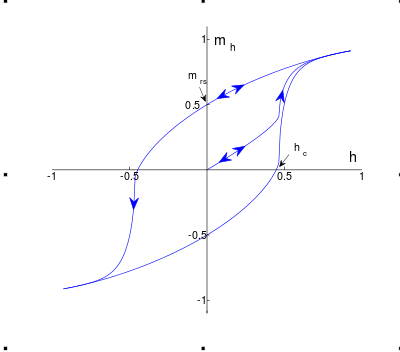 Vectorial Incremental Nonconservative Consistent Hysteresis model. ^ Pomerening, Joseph R.; Sontag, Eduardo D.; Ferrell, James E. (2003). "Building a cell cycle oscillator: hysteresis and bistability in the activation of Cdc2". Nature Cell Biology. 5 (4): 346–251. doi:10.1038/ncb954. PMID 12629549. ^ Ferrell JE Jr.; Machleder EM (1998). "The biochemical basis of an all-or-none cell fate switch in Xenopus oocytes". Science. 280 (5365): 895–8. Bibcode:1998Sci...280..895F. doi:10.1126/science.280.5365.895. PMID 9572732. ^ Doncic, Andreas; Skotheim, Jan M (2013). "Feedforward regulation ensures stability and rapid reversibility of a cellular state". Molecular Cell. 50 (6): 856–68. doi:10.1016/j.molcel.2013.04.014. PMC 3696412. PMID 23685071. ^ Darlington, C. D. (1937). Recent Advances in Cytology (Genes, Cells, & Organisms) (Second ed.). P. Blakiston's Son & Co. ISBN 978-0-8240-1376-9. ^ Rieger, R.; Michaelis, A.; M. M. (1968). A Glossary of Genetics and Cytogenetics : Classical and Molecular (Third ed.). Springer. ISBN 978-3-540-04316-4. ^ Harfe, B. D.; Scherz, P. J.; Nissim, S.; Tian, H.; McMahon, A. P.; Tabin, C. J. (2004). "Evidence for an expansion-based temporal Shh gradient in specifying vertebrate digit identities". Cell. 118 (4): 517–28. doi:10.1016/j.cell.2004.07.024. PMID 15315763. ^ Lek, M.; Dias, J. M.; Marklund, U.; Uhde, C. W.; Kurdija, S.; Lei, Q.; Sussel, L.; Rubenstein, J. L.; Matise, M. P.; Arnold, H. -H.; Jessell, T. M.; Ericson, J. (2010). "A homeodomain feedback circuit underlies step-function interpretation of a Shh morphogen gradient during ventral neural patterning". Development. 137 (23): 4051–4060. doi:10.1242/dev.054288. PMID 21062862. ^ Das, J.; Ho, M.; Zikherman, J.; Govern, C.; Yang, M.; Weiss, A.; Chakraborty, A. K.; Roose, J. P. (2009). "Digital Signaling and Hysteresis Characterize Ras Activation in Lymphoid Cells". Cell. 136 (2): 337–351. doi:10.1016/j.cell.2008.11.051. PMC 2662698. PMID 19167334. ^ Escolar, J. D.; Escolar, A. (2004). "Lung histeresis: a morphological view" (PDF). Histology and Histopathology Cellular and Molecular Biology. 19 (1): 159–166. PMID 14702184. Retrieved 1 March 2011. ^ West, John B. (2005). Respiratory physiology: the essentials. Hagerstown, MD: Lippincott Williams & Wilkins. ISBN 978-0-7817-5152-0. ^ Lucero, Jorge C. (1999). "A theoretical study of the hysteresis phenomenon at vocal fold oscillation onset–offset". The Journal of the Acoustical Society of America. 105 (1): 423–431. Bibcode:1999ASAJ..105..423L. doi:10.1121/1.424572. ISSN 0001-4966. ^ a b Ball, Laurence M. (March 2009). "Hysteresis in Unemployment: Old and New Evidence". NBER Working Paper No. 14818. doi:10.3386/w14818. ^ Blanchard, Olivier J.; Summers, Lawrence H. (1986). "Hysteresis and the European Unemployment Problem". NBER Macroeconomics Annual. 1: 15–78. doi:10.2307/3585159. JSTOR 3585159. ^ a b R. V. Lapshin (1995). "Analytical model for the approximation of hysteresis loop and its application to the scanning tunneling microscope" (PDF). Review of Scientific Instruments. 66 (9): 4718–4730. doi:10.1063/1.1145314. ISSN 0034-6748. .
^ S. Maynes; F. Yang; A. Parkhurst (November 20, 2013). "Package Hysteresis (Tools for Modeling Rate-Dependent Hysteretic Processes and Ellipses)". R-project. Retrieved June 11, 2018. ^ Bouc, R. (1967). "Forced vibration of mechanical systems with hysteresis". Proceedings of the Fourth Conference on Nonlinear Oscillation. Prague, Czechoslovakia. p. 315. ^ Bouc, R. (1971). "Modèle mathématique d'hystérésis: application aux systèmes à un degré de liberté". Acustica (in French). 24: 16–25. ^ Wen, Y. K. (1976). "Method for random vibration of hysteretic systems". Journal of Engineering Mechanics. 102 (2): 249–263. Chikazumi, Sōshin (1997). Physics of Ferromagnetism. Clarendon Press. ISBN 978-0-19-851776-4. Jiles, D. C.; Atherton, D. L. (1986). "Theory of ferromagnetic hysteresis". Journal of Magnetism and Magnetic Materials. 61 (1–2): 48–60. Bibcode:1986JMMM...61...48J. doi:10.1016/0304-8853(86)90066-1. Krasnosel'skii, Mark; Pokrovskii, Alexei (1989). Systems with Hysteresis. New York: Springer-Verlag. ISBN 978-0-387-15543-2. Mayergoyz, Isaak D.; Bertotti, Giorgio, eds. (2005). The Science of Hysteresis (3-volume set). Academic Press. ISBN 978-0-12-480874-4. Mielke, A.; Roubíček, T. (2015). Rate-Independent Systems - Theory and Application. Springer, New York. ISBN 978-1-4939-2705-0. Truesdell, C.; Noll, Walter (2004). Antman, Stuart (ed.). The Non-Linear Field Theories of Mechanics (Third ed.). ISBN 978-3-540-02779-9. Originally published as Volume III/3 of Handbuch der Physik in 1965. Visintin, Augusto (1994). Differential models of hysteresis. Springer. ISBN 978-3-540-54793-8. Noori, Hamid R. (2014). Hysteresis phenomena in biology. Springer. ISBN 978-3-642-38217-8. Look up hysteresis in Wiktionary, the free dictionary.